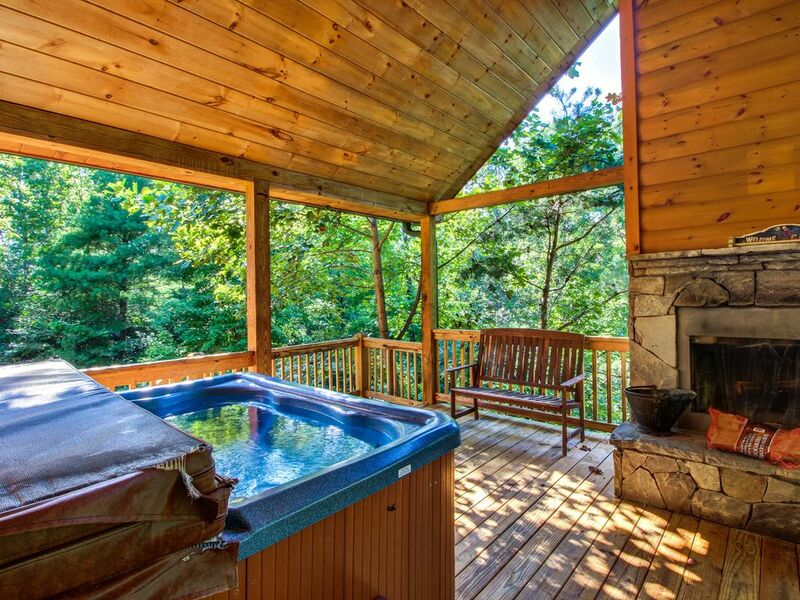 Effortlessly combining luxury and natural beauty, this dog-friendly cabin provides gorgeous mountain views, a pool table, and your very own private hot tub! This Sautee Nachochee home for four is surrounded by the most beautiful wilderness North Georgia has to offer, with the nearby Bavarian town of Helen providing shopping, dining, and more! The living room is perfect for kicking back and relaxing with your friends and that special someone, with comfy furnishings, a nearby wood-burning fireplace, and a flatscreen TV with WiFi. Don't forget about the hot tub on the screened-in back deck! Whether you dine at the island and indoor table seating for four or the outdoor tables, you'll love meals prepared in the kitchen, fully equipped with stainless steel appliances and a dishwasher for easy cleanup. Four guests (and three dogs, for a small nightly fee) can enjoy this home's two bedrooms and baths. Each room boasts a luxurious king-size bed, an en suite bath, and flatscreen TV. There's also a private washer and dryer to keep your clothes nice and fresh! Natural beauty awaits with summertime fun like tubing, swimming, and fishing in the Chattahoochee River! Meanwhile, fall visitors can enjoy authentic Bavarian festivals in the town of Helen, including the bombast of a traditional Oktoberfest. Place your reservation today and enjoy the combination of natural isolation and luxury you never knew you wanted! Parking Notes: Motorcycles and trailers are allowed at this property. Driveway is paved, but steep. All-in-all, it was a wonderful experience and we cannot wait to come back soon! What a wonderful place to stay. Everything was clean and we were centrally located to hiking and Helen. The place was nice, excluded. We enjoyed our stay, it is a very nice cabin. Kitchen could use some attention but all in all we were able to do what we needed to do. Both fireplaces worked just fine as did the hot tub although I'm not sure the deck is up to code for a hot tub. Lastly the cleaning crew might have done a better job policing the grounds around the cabin. Not really bad so it would not have taken that long. We apologize for the issues this guest encountered during their stay. The property manager has created a checklist based off this feedback in order to ensure all issues are dealt with. Thank you! This is the 4th time that my wife and I have stayed at a cabin in the mountains. We have always had very good experiences with the first 3 that we rented. This cabin was a perfect layout. It was exactly like the pictures. The view was beautiful. However, there was a few problems. First the grill, the propane tank on the grill looked very old and rusty and the knob that turns on the gas was rusted shut and could not turn it. We could not use the grill during the trip. The most disappointing about the cabin was the windows. They were extremely dirty from top to bottom. We could see hand prints all over the windows and streaks at the top, it took away from the beauty of the scenery. If there was window cleaner in the cabin, my wife would have cleaned them herself. Overall, we loved the time that we spent there. We are glad to hear this guest enjoyed their stay! The grill is brand new and our local team will ensure it is in good working order before the next guest. The windows will be cleaned thoroughly as well. We can't wait to host this guest in the future!